Concordia Cruise Ship Accident Foretold. Update: the Allegra and Azamara too! a repeat accident on the cruise ship "Azamara Quest"! Exactly 45 days after the Costa Concordia wreck, her sister ship, the Costa Allegra, is stranded in shark and pirate invested waters without power; all this with the fear of what happened to the Concordia fresh in their minds. A fire had occurred in the engine room at 1 pm, Monday, and the passengers prepared to abandon ship, but fortunately the fire was put out. By repeating the sign of the Concordia with its sister ship, God seeks man's attention. However, the fact that the two accidents are 45 days apart is what's astounding. But before we come to that, first more about what the signs mean. 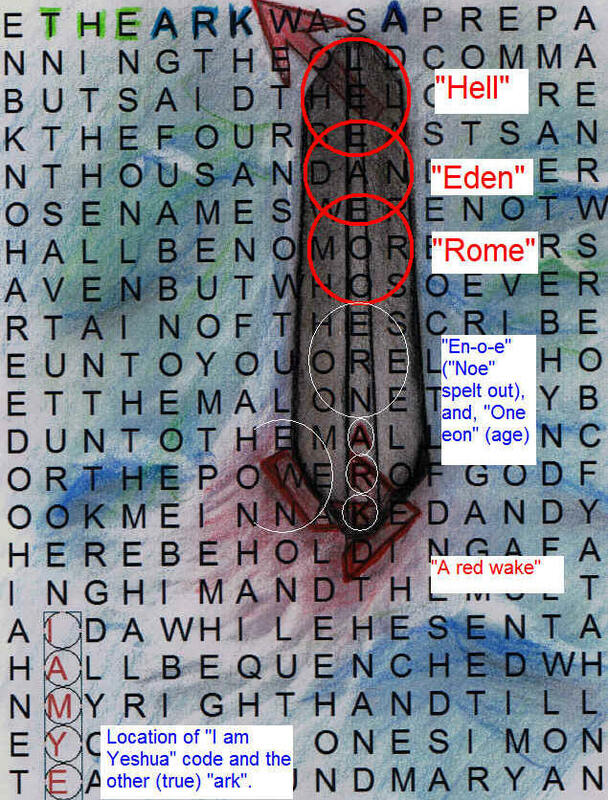 "The encoded ship is called "Rome", claims to be paradise ("Eden"), but instead is headed for "Hell!" (i.e., destruction)." The Allegra, which is about a third of the size of the Concordia, still has no power and hygienic conditions are worsening. There is no running water, which means toilets are not functioning and passengers are unable to take showers or properly wash. The passengers and crew have had to sleep on the outdoor decks using their lifejackets as cushions..."
NAIROBI, Kenya (AP) — Helicopters ferried food and flashlights to more than 1,000 passengers and crew stuck aboard a disabled cruise ship that is being towed to the Seychelles Islands through waters prowled by pirates, officials said Tuesday. The fire aboard the Costa Allegra comes only six weeks after one of its sister ships, the Costa Concordia, hit a reef and capsized off Italy, killing 25 people and leaving seven missing and presumed dead. Moreover, I also wrote before about the importance of the week (seven days) for both of these first two shipping accidents. Also, for the first accident, I wrote about the significance of the "middle of that week". Mat 24:36 "But concerning that day and hour no one knows, not even the angels of heaven, nor the Son, but the Father only. Mat 24:37 For as were the days of Noah, so will be the coming of the Son of Man. It was a fishing trawler that towed the Allegra to safety. 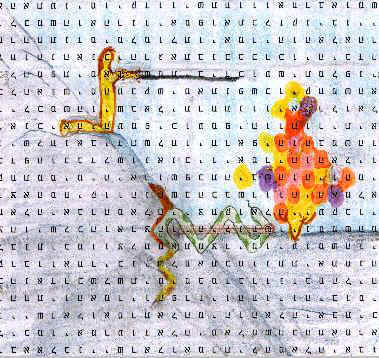 Likewise, in the encoded image there are two ships; (see lower image). The large ship is being towed to shore by the smaller fishing boat. In other words, God urges his disciples to pull the net full of men to shore. Jesus would have us to be fishers of men! Interestingly, the actual surface text that runs through the stern on the large ship about where the engine room would be reads, "The power of God". (The fire occurred in the engine room, which knocked out all power to the ship.) This is interesting because this large ship in the picture-code symbolizes the Allegra that lost its power! God would have us to rely on His power, and not one's own works for salvation. (Like the ship), turn to him and be saved! An awesome example of 'perfect timing'! Titanic sank EXACTLY 100 years before the Azamara Accident! After the Costa Allegra, 32 days later another repeat accident occurred, also in shark and pirate invested waters -- but this time is Sumatra. Late evening on March 30th, 2012, the engine of the cruise ship, the "Azamara Quest", too, had an explosion. 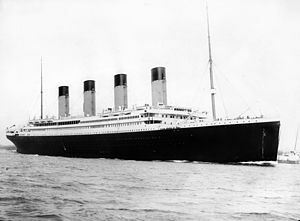 It was carrying 1000 people and they, too, at first had to put on life jackets thereby striking fear into their hearts. Most power was knocked out for 24 hours thereby setting it adrift. It took another 24 hours to make shore under the ship's own power, escorted by other ships. This was the third cruise-ship accident in 77 days, an unusual string of accidents. God is speaking! 100th Anniversary of the Titanic -- almost to the very hour! 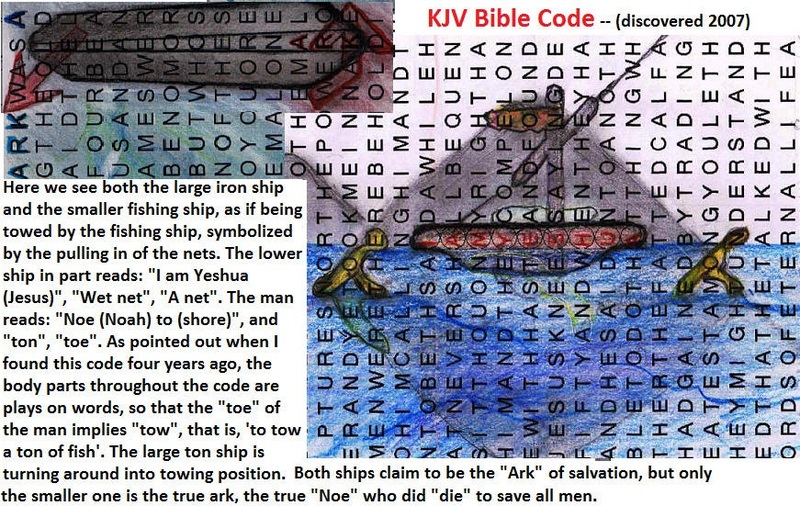 In the article about the Concordia, we drew parallels between that cruise ship and Noah's ark -- in keeping with what the KJV bible-code pictogram read. But at that time, I had wondered why the first two cruise-ship accidents did not occur on an anniversary day to do with Noah's ark. Well, as it turns out, both the Titanic and the Azamara incidents occurred on "the second month, the 26th day of the month" on the 360-calendar, which is the day before Noah and his family left the ark. This means that the Azamara (meaning, "Blue Sea") was escorted to land on the 27th day of the 2nd month -- which is indeed when Noah and his family left the Ark. 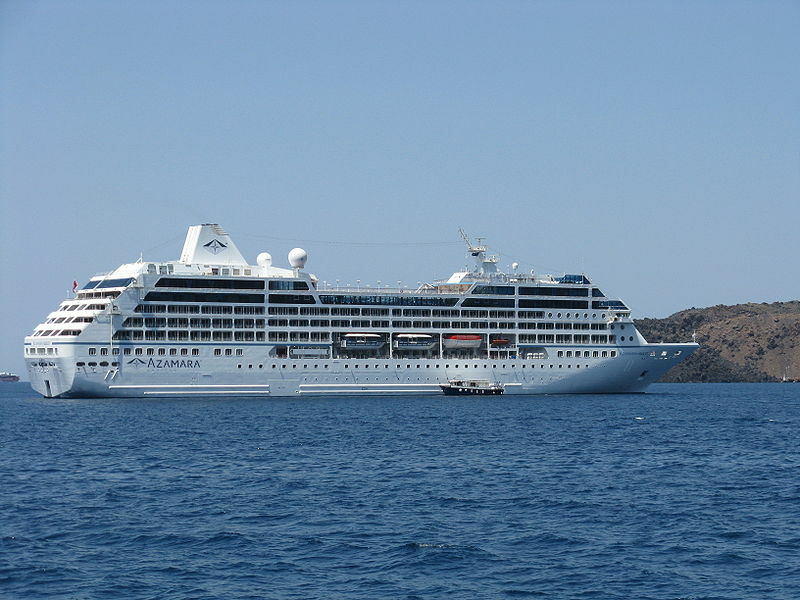 Later that same Sunday, April 1, 2012, the passengers of the Azamara disembarked. Gen 8:14-16 "And in the second month, on the seven and twentieth day of the month, was the earth dried. And God spake unto Noah, saying, Go forth of the ark, thou, and thy wife, and thy sons, and thy sons' wives with thee." Moreover, it happens that the second month, the 26th day and/or the 27th day also happens to be the anniversary of when Jesus ascended up to heaven -- 40 days after his resurrection on Nisan 16th or 17th. 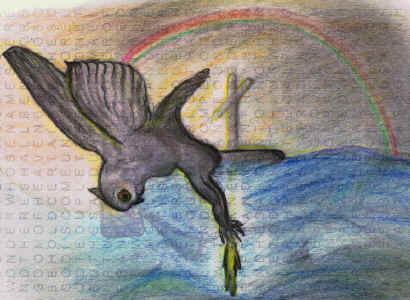 This means that both Jesus' ascension out of this world up to heaven and Noah's leaving the Ark into the new world -- they both carry a similar theme -- 'leaving this world into a new and better world'. But if that were not enough, Friday, March 30th, 2012, when the accident aboard the Azamara occurred, was also the beginning of "Passion Week" on the religious calendar kept by most Christians throughout the world, which is, the commencement of the last week of Jesus' life as detailed in all four gospels. Therefore, this also means that when the ship made land two days later, that day was "Palm Sunday" -- the anniversary of when Jesus rode into Jerusalem on a donkey as "king". But not just that, the regular Jewish calendar this year happens to be in synchronization with the Christian calendar. Therefore, this year "Palm Sunday", "Good Friday", and "Easter Sunday" all occur on the actual literal anniversary dates as they were when Jesus died. Hence, this year Good Friday was also Passover on the Jewish calendar and Easter Sunday was also "the feast of First-fruits" on the Jewish calendar, Nisan 14th and 16th respectively. This therefore means that the Azamara disembarked from the ship on Nisan 10th (being after evening that day), which happens to not only be the anniversary of when Jesus rode into Jerusalem on a donkey, but also the anniversary of when the nation of Israel left their 40-year desert wanderings and crossed the waters of the Jordan river into the promised land! This means that the events of the Azamara were timed to the anniversaries of several key events in the bible, all having the same theme -- that is, the leaving of one world into the next! What are the odds of all this coming together in one event on three different calendars -- and that on the 100th anniversary of the Titanic! 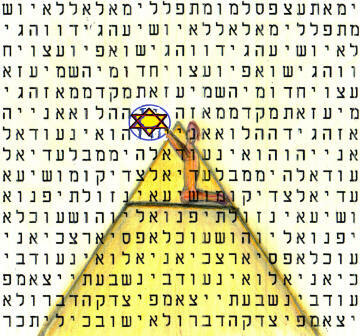 Bible-Code Acrostic and the Number of "Forgiveness"
"7, 77, 777, and 70 x 7 x 7"
The day before the Azamara cruise-ship accident, I put out a shortened version of the Acrostic Names Code on Youtube of what I originally put out 770 days earlier. 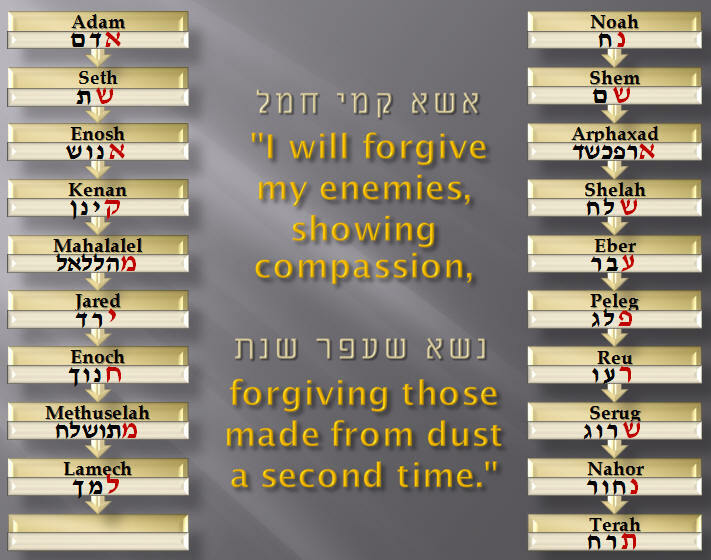 "This is where the first letter of each name in the Genealogies from Adam to Noah unto the father of Abraham form an acrostic that reads: "I will forgive my enemies, having compassion, forgiving that which is of the dust as second time". The first time that God forgave "His enemies" was just after the flood "in the second month, the 27th day", when they left that ark: at that time God set the rainbow in the sky, promising not to destroy the earth again by water. Therefore, it is significant that the Azamara cruise-ship accident occurred 77 days after the first cruse-ship accident of the Costa Concordia (on Friday the 13th of January). This is highly significant because "77" is the number of "forgiveness" as explain several years ago in the article about this Acrostic. So, God is reminding us of the Ark once again, and of forgiveness. God is warning that the time to be saved and enter the Ark of Jesus Christ is now. All other boats are doomed! Moreover, in the article about the acrostic and "forgiveness" about "77", I not only speak about the number "77", but also about "7", "777" and "70 x 7 x 7". But that is not all, 70 x 7 x 7 days earlier coincides with the death of Lamech who lived to be 777 years of age and died seven years before they left the ark of Noah!!! Moreover, Lamech died five years before the Flood. Therefore, Lamech's life span of 777 years was from 3430/3428 to 2651/2653 BC (depending if to include the "two years" of Genesis 11:10). Then, 777 years after that was 1876/1874 BC (of Passover, when Israel entered Egypt and Joseph was reconciled with his brethren), and thus begins the pattern of ongoing 777's. And as said, Passover and Resurrection-day (Nisan 15th/17th, 2012) this year were represented by the symbolic years of AD 783 and 785, which happens to be 7 x 7 x 70 years back to the year of the Flood (either 2646 or 2648 BC) -- and, (as explained next), was 777 days from when the Names/Acrostic Codes placed on Youtube, etc. If the arrangement of these dates do not cause you to emit an involuntary shout of amazement, then you have not grasped the power of God's timing of all these things! And I could go on and on like this, but enough said! What is the connection between the sign of the solar flares and the ships (representing Noah's Ark)? The solar flare was a sign in the "heights above", the other "in the depths beneath". One to do with destruction by fire, the other by water! Curiously, the 3-D remake of the movie the "Titanic", came out in theaters about a week after its producer, James Cameron, plummeted to the lowest place on earth -- in the Mariana Trench, seven miles beneath the sea. Interestingly, four days earlier Cameron (in association with National Geographic) completed the test-dive to the bottom of the Mariana Trench, Wednesday, March 22, 2012. What is significant about that date? Well, on the 360 calendar, March 22, 2012 is the anniversary of when the great flood of Noah occurred and this very trench was formed! 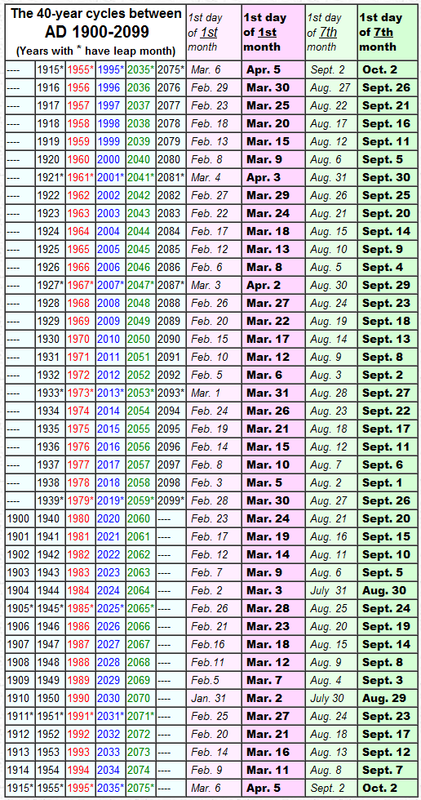 As you can see from the below chart, March 22, 2012 can either be the 17th of the first or second month. (See "360 Calendar" for why and how.) As said, the second month is the anniversary of when the flood occurred and the trench was formed. However, the 17th of the first month (as said earlier) is the anniversary of when Jesus rose again. Jesus died on the first day of Passover. Roughly in the middle of Passover-week He rose again from the Abyss (Sheol/grave). Passover-week itself ends on the 21st of the first month, which is four days after Jesus died, and therefore is when James Cameron went down into this abyss because James Cameron made his journey four days after the unmanned dive. In this way God has divided the week of Passover using the two dives! And by so doing ties the symbolism of 'the bursting forth of the great deep at the flood' with 'Christ's death and resurrection'. As said, ultimately all these thing speak about Jesus, who died and descended to the lowest Abyss only to rise to the highest height 40-days later! God is constantly combining calendars like this to tie in different anniversary events found in the bible so as to tell one composite story that in turn ultimately points to Christ as its main fulfillment. I have witnessed this sort of numeric control of human and natural events hundreds of times and have recorded about a hundred of such events already on this website. When something is of God, the correct key opens all the doors with ease. Nothing needs to be forced. The problem is knowing when to stop pondering the event because God's signs are always bottomless. You can never come to a point when you say, "I know all there is to know about this sign from God". These signs are God's way of telling parables like Jesus so often did during His early ministry. 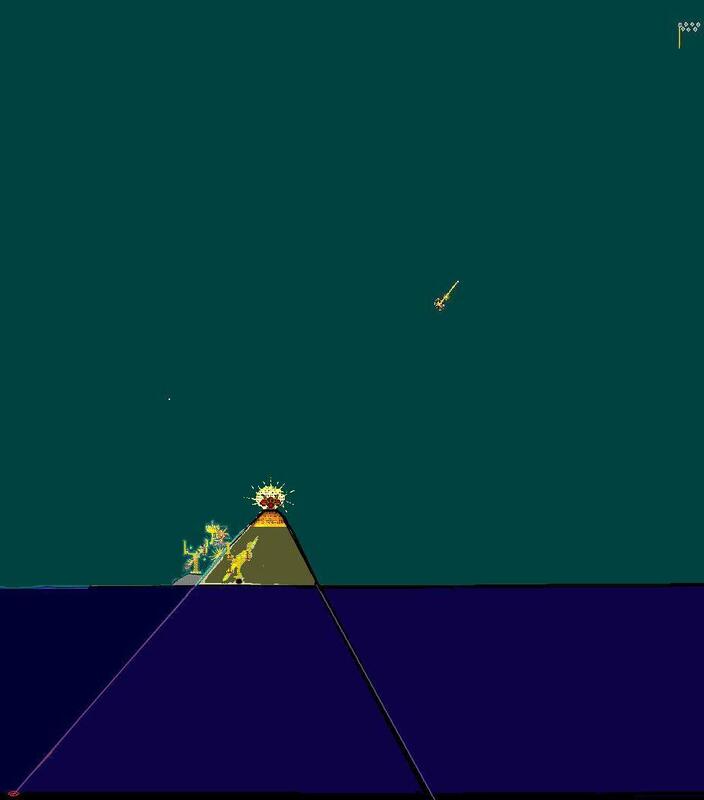 This parable of the Titanic and the three cruise ships (along with the solar flare of a month ago) speak about the death and resurrection of Christ, and of the end of the age when He return to judge this world, not with water as He did at the Flood, but this time with fire. God is saying that the time of mercy and forgiveness is now (as evidence by the numeric "7, 77, 777, and 7 x 7 x 70", both in days and years). He alone is the 'ark' of God and whosoever believes on Him enters into that ark and is saved from the fiery wrath of God! 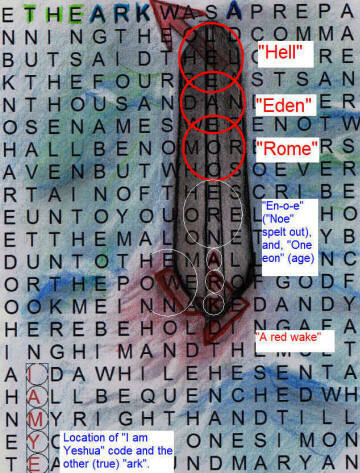 Below is quoted directly from an article about this below picture bible code, put on the internet four or five years ago. The encoded image mainly depicts the waters of the "great deep" bursting open at the Flood. 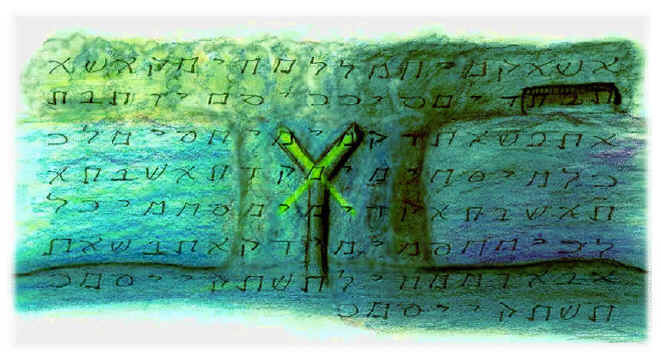 The encoded pictogram is located in the genealogy of Adam to Lamech, the father of Noah. (This is the same Lamech who lived 777 years.) The ark of Noah can be seen at upper right of image. Please see the article for details. Encoded are paragraphs of powerful poetic text that infer throughout that Jesus is the "Alpha and the Omega" -- and every letter in-between! The following is copied as is from that original article, which is part of the Names Acrostic mentioned earlier. Each can also be shown to share the same anniversary dates of Nisan 14-17 (and the morning of 18th)! Here is a small portion of this particularly massive code. 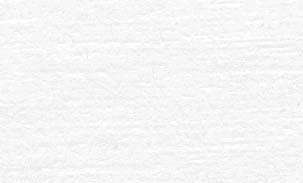 It contains elements of the five above mentioned events. 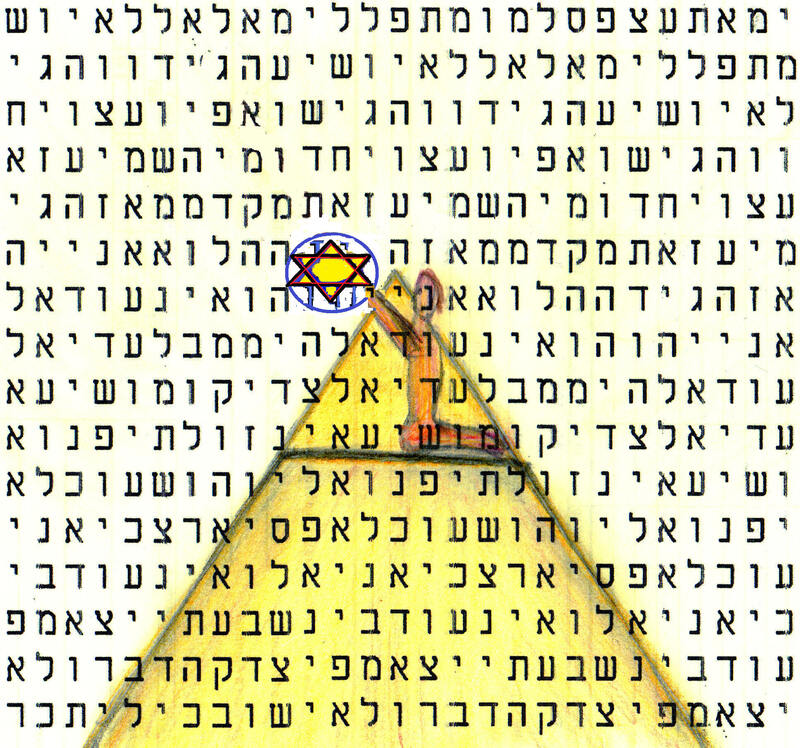 It contains many play on words to do with certain letters of the Hebrew Alphabet that are explained in the full article. By so doing it personifies the "waters" (Hebrew letter "Mem") in this poetic description of 'Christ bowing the head on the cross -- hands outstretched'. The poetry uses mirrorism, that is, it is structured so that the first lines mirror the last, and so forth. "When Jesus had received the sour wine, he said, "It is finished," and he bowed his head and gave up his spirit", (John 19:30). "And Jesus cried out again with a loud voice and yielded up his spirit. And behold, the curtain of the temple was torn in two, from top to bottom. And the earth shook, and the rocks were split", (Mat. 27:50-51). 2.) are rising! Waters are rising! 7.) More than enough sea! 9.) will rise! Who will rise? 10.) Being still, he bows the head! Who bowed the head? The one kindling the ancient waters (into) a flame! 16.) Who crushed them? A hand is upraised! 23.) the waters of the sea? 24.) More than enough sea! 25.) Being still, he bows the head! Who bowed the head? 26.) A hand is upraised. 30.) A hand is upraised.